In this post I want to continue the storm theme from last week and share some footage of the snow storm we experienced. This storm arrived three days after we survived the piteraq, and stopped us in our tracks for another couple of days. Unfortunately it settled right over the top of us and was not moving at all, and literally started burying our camp. 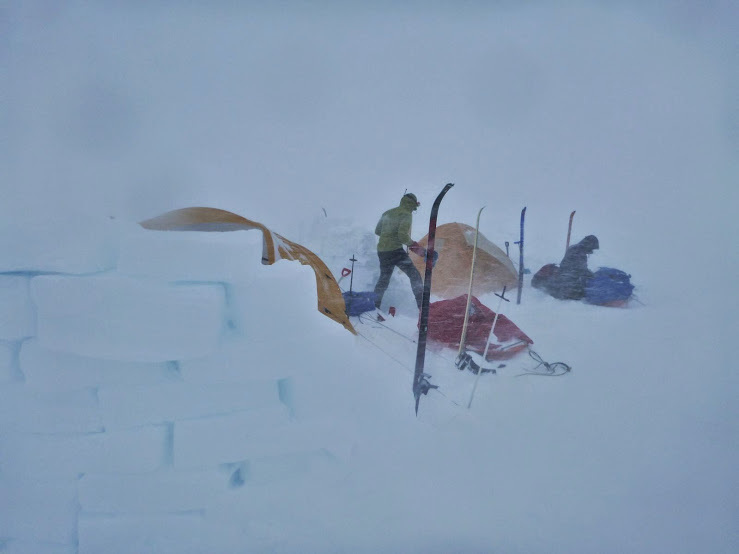 We were not in a position to move either given how fresh the snow was, and given a new gound level was being created around us it would be virtually impossible to re-anchor the tents properly on a new location had we tried. One serious risk we faced in this situation though was the snow setting into ice – which would happen at some point – and trapping our gear. If this happened then it was going to take an extraordinary amount of energy and effort with our ice picks to try and recover everything to pack up camp. Luckily around 14:00 on the second day a small 'break' in the weather came, and when I say 'break' I mean we could now at least see what our feet were standing on 😉 *chuckle*. A group decision was made and we decided to take the chance whilst we could to start working our way out from under the storm. If we lost this small window of opportunity and lost the next day as well then time (and food) was going to become a serious concern. By the way, the new ground level around our camp when we left was approx 1.5-2.0m's above what we had initially set up. But more scarily, 20m's behind our camp in the direction of the wind, there was another new ground level approx 4-5m's high which our guide Robert walked up onto! I know, crazy huh! We could see the top of it ever so slightly and initially thought it was the horizon. We were wrong. Hope you enjoy the video, ciao for now! That snow storm stuff is pretty crazy…geez…I look at it with a dropped jaw and my eyes nearly falling out. Did you ever feel in danger / curse the day you decided to do it? How did you keep morale up as a group with all the challenges that were thrown at you? Or are you just in a zone of getting on with what you need to do, putting one step in front of the other and only thinking about that? Thanks! Hi Vanessa 🙂 a few questions to answer there, I like it! On the first part, yes, I definitely felt in danger – or ‘felt the dangers of’ – the weather conditions we sometimes found ourselves in. For the snow storm specifically, it was quite intense. We were all very aware of the fact that if you dropped behind too far or lose sight of the person in front, you may not be found till the weather clears. As such, we all made doubly sure to stay very close behind the person in front and keep a constant check on the person behind. We were one breath away from roping ourselves together would you believe too, because of how bad the weather conditions became. ….actually, during the piteraq I had a particularly adrenaline fueled moment i.e. when I couldn’t find the way back to my tent from the main one! 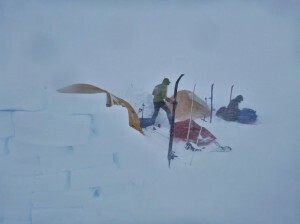 We had been attempting to rebuild the snow wall of the front main tent which had been blown away, but our guide called it off in the end because it was just too dangerous. So I started crawling back to my tent. Now, I knew my tent was directly down wind from the main tent’s vestible area, and only by a few meters too. 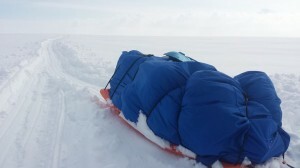 But even with my shovel anchored at the last point where I could make out the main tent behind me, and stretching out as far as I could go whilst holding onto the shovel as my anchor, I couldn’t reach or see my tent’s snow wall, nor the pulka I knew to be lying nearby. Even knowing I must have been only a couple of feet away if that, I could not for the life of me bring myself to let go of that shovel to reach out further. In my head a voice just said ‘if you slip… if you stumble… or anything… ‘ – it was very easy to become disorientated in those conditions and lost. Very unnerving. Luckily, Eric – my tent buddy – happened to come around our tent’s snow wall doing some maintenance shortly after and gave me a focal point. So with his shadowy outline in my sight I went straight for him and finally found the wall to follow back around to our tent. Lastly, your question on morale is a good one to raise, as the mental aspect of an adventure like this is considered in many ways to be more challenging than the physical. It was tough going, really tough at times, and the weather can make it all the more draining because of constantly having to concentrate on where your feet are going, watching for pits/sastrugis, watching your team mates and more.. But you do get into a bit of a zone though, and really there is nothing else for it but to keep putting one foot in front of the other as you say – the fact is, you have no choice 🙂 ….also, finding the odd packet of bacon rashers in the food bag helped lift the mood 😉 and sharing around a bottle of 80pc alcohol Stroh rum or single malt scotch for a shot to warm the belly during dinner too *chuckle*. Lots to digest and process for you! I imagine it has changed your outlook on many things, 'normal' life challenges, and how you deal with them? Yes, I know that feeling of integrating a mind-blowing experience that has touched you deeply. The void before the new emerges. Someone called it the silence before the music starts, which I quite like, full of potential yet drenched in uncertainty. So, ever curious as I am, are you up for sharing how exactly it has changed your perspective on life? I've felt a pull towards the ice regions for ages, reading about your adventure has moved a trip to Antarctica up on my bucket list, so am particularly interested in how being there has impacted people at a personal level. ‘Full of potential yet drenched in uncertainty’ – I like it 🙂 …scary yet exciting.